The American Board of Internal Medicine (ABIM) established the Item-Writing Task Forces to help Exam Committees keep up with the increased demand for content associated with the new Knowledge Check-Ins. There are Task Forces for all 20 disciplines, each focused exclusively on using an innovative, model-based approach to the development of exam content. This approach—grounded firmly in research[i]—is known for helping to scale up content development while maintaining high content quality. 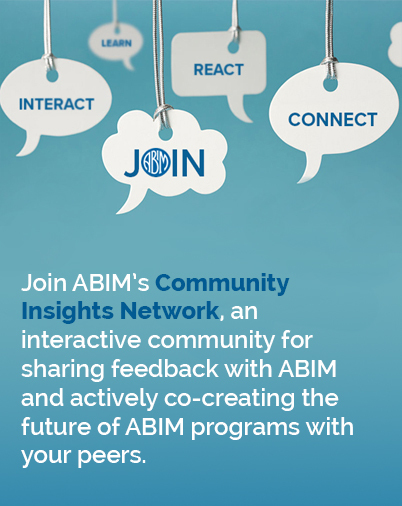 The Task Forces are critical to ABIM’s ability to deliver Knowledge Check-Ins more efficiently and to generate a substantially higher number of questions with the aspirational goal of making each question “single use.” Being a part of an Item-Writing Task Force will allow for further innovation in ABIM’s assessments, ultimately benefitting both you and your peers. Watch the video below to hear about the Item-Writing Task Forces from the perspective of fellow physicians. Item-Writing Task Force members serve renewable one-year terms and spend about 4-6 hours per month remotely developing exam content through a model-based approach. Each quarter, they then join a two-hour call to review the exam content with other Task Force members. Applications are now being accepted for physicians to serve on an Item-Writing Task Force in their specialty and the deadline to apply is March 1, 2019. [i] Gierl, M., Lai, H., & Zhang, X. Automatic item generation. Advanced Methodologies and Technologies in Modern Education Delivery. 2019; 192-203. Embretson, S., & Yang, X. 23 Automatic Item Generation and Cognitive Psychology. Handbook of statistics. 2006; 747-768.